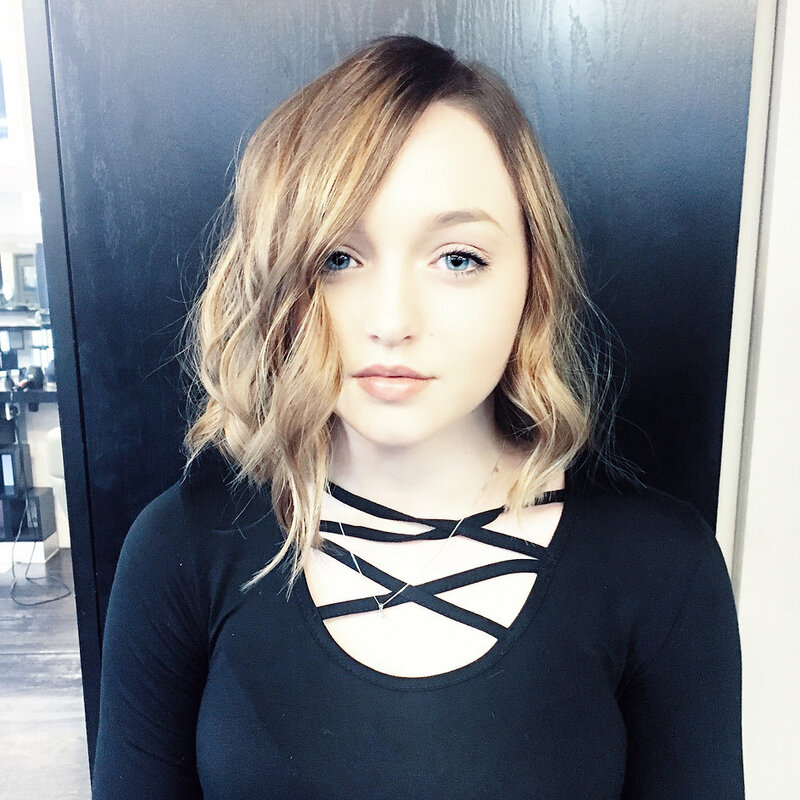 Deciding to venture into a new salon is no easy feat; the relationship that one builds with both their locks and their stylist is a marriage of sorts, nurtured over time and resting upon a mutual understanding that we do not mention The Fringe of 2008. So entrusting someone new with your hair is a bit like going on a first date…with scissors and bleach involved. When I arrived at Easton Regal in Clerkenwell I was feeling rather nervous; I had decided that I was going to have a really good chop, a look I haven’t rocked since I was about 16 and vaguely resembled Paul Mitchell in a wig. Thankfully George, my fabulous stylist, totally understood my moon-faced fears and we discussed a good, sharp cut that would feel fresh for Spring without accentuating my round face. I had brought in a photo of Khloe K’s ‘lob’ (yeah, I know, Kardashian style inspo wasn’t my proudest moment ever) though was a little fearful that it never actually ends up looking like the image. To my total surprise and joy, this time it did! A bad salon experience in December had resulted in a years worth of lifting being swiftly covered over with a dark semi-perm in time for the Christmas party season; a quick fix that, come January I was kind of regretting, I missed my naturally cool tones and the soft blonde highlights I’d been patiently building up. I genuinely wasn’t sure what anybody would actually be able to do with my awkwardly fading hair, which had suffered as a result of over–processing too, and so decided to put all my faith in Grace’s competent hands. She made me feel instantly at ease as she explained how she would begin to lift my hair again and I found myself nodding along contently, not because I didn’t know any better but rather because I instantly trusted her abilities. A trip to the hair salon can feel like the ultimate self–care session if you go to the right place and we chatted away about everything from dogs to babies to Broadchurch whilst I happily sipped tea and Grace skilfully tackled my tired looking locks. The latest buzzword in the hair care industry is Olaplex, a formulation that repairs the bonds damaged by colouring and protects the hair against future harm. Given the state of my hair I was really keen to try it and see if it actually works and I was really pleasantly surprised; last time I had my hair coloured I spent days having to be very, very careful about what I did with it as it felt gummy in places and straw like in others. This time round, my hair is as soft and silky several days later as it was when I left the salon and I have found that when washing it I haven’t had nearly as many tangles or knots! Usually when I’m offered additional services I’m a bit dubious (I paid an extra tenner once for a Keratin treatment that literally made zero difference) but I’m totally sold on Olaplex and will definitely be adding it on to any future colour appointments, as well as purchasing the at home version for some weekly TLC. When it was time to go for the chop both Grace and George were really cool about it, which is exactly what I needed. 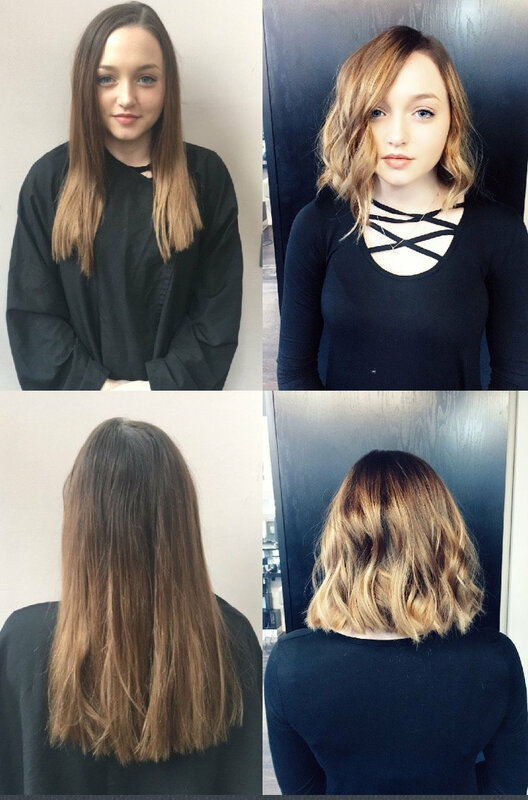 I was feeling pretty anxious about having such a dramatically different restyle but neither of them made a fuss and thus I felt that their encouragement toward my new do was completely honest; George chatted to me throughout and kept me distracted from the great chunks of hair making their way down to the floor! No amount of product or styling can ever replace a really good cut and I am totally thrilled with how versatile even a short look has turned out to be; George cut it so that I can wear my parting wherever I please and it looks equally as good poker straight as with beach waves (at which he is an absolute expert!) I think the real test is how it looks days later once you’ve washed, dried and styled it for yourself and almost a week on I’m so pleased with the condition of my hair and how easy to style it is as I was worried that short hair might be very high maintenance. I entered the salon with drab, faded locks in desperate need of some love and care that made me feel a bit self-conscious, and I left feeling fabulous. That’s the best gift a salon can really give you, isn’t it? The confidence to love your hair again. Grace’s free-hand balayage colouring has completely lifted the look and I now know exactly what the next steps are to eventually achieve my goal colour and George has completely won me over with a short, sharp chop that I honestly never really believed I could pull off. After a pretty hairy (sorry…) experience back in December I was genuinely a little fearful of stepping back into another new salon and with so many on offer in London it can be hard to know where to trust but Easton Regal was by far the right decision and I’ll definitely be returning in the future as well as widely recommending their services! They’ve even got a handy little app that you can book your appointment via. 84 Clerkenwell Road, London, EC1M 5RF; Mon: closed, Tues: 10.00-19.00, Wed: 10.00-21.00, Thurs: 9:00-20:00, Fri: 10.00-20.00, Sat: 9.00-18.30, Sun: closed. I visited the salon with compliments from Easton Regal. All views are my own.